Big Island helicopter tours are a great way to view the lava from the vantage point of the sky PLUS you can expand your tour to view the Big Island’s incredible landscape. Pros: Helicopter tours provide an aerial view of Big Island lava, which is ideal if the flow is too far away to see by land or by sea. At night, you can see the glowing lava from the sky, which is an experience few ever forget. Also, your helicopter tour may also include a tour of the Big Island itself, and you can experience the different climatic zones, from the arid desert to the frigid tundra to the lush rainforest. 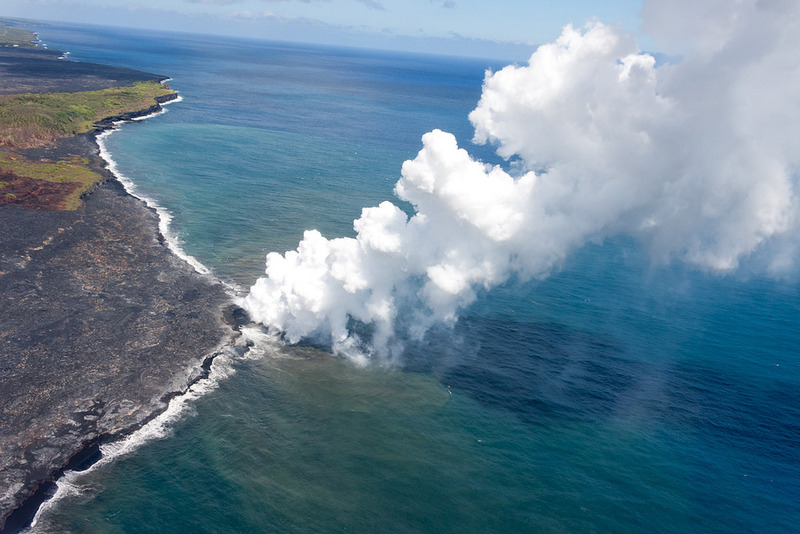 Whether by land, air or sea viewing Hawaii lava flows is unforgettable! Cons: Helicopter tours can be pricey, especially if you’re taking a large group. Expect to pay $200-$250 per person for a quality tour. In addition, if someone in your party is prone to air sickness, the tour will be entirely unenjoyable! In addition, if you’re traveling with a large group, you won’t be able to share a helicopter with all of those in your party. Helicopters typically only hold about 4 people. You’ll find a myriad of sea tours available for those of you who want to view the lava from the vantage point of the ocean. Many lava tours take groups out on catamarans, which are steady and large. Pros: Depending on the lava flow that day, lava boat tours may be your best bet at seeing the lava up-close. One reviewer commented that they were able to get within ten yards of the actual lava flow, which is closer than you’ll get taking an air tour. Also, the boats used during the lava tours are typically sturdy and hold a fair amount of people. So, if you’re traveling with a large group, there’s a chance you can all share the same boat. Helicopters typically only hold about 4 people. Cons: Seasickness. If you’re prone to seasickness, you’ll want to skip this tour, as there’s a good chance you’ll be idling a bit when viewing the lava. In addition, these tours typically leave quite early — around 5:15 am — so, you’ll need to get up very early to get the best views. These tours are also expensive with many tours priced at about $150 per person. So, you won’t be able to see the lava cheaply if you take a boat tour. This is how I saw my last Big Island lava flow, and I was lucky enough to touch the flowing lava with a stick! However, viewing lava by land is highly dependent on where the flow is at the time. 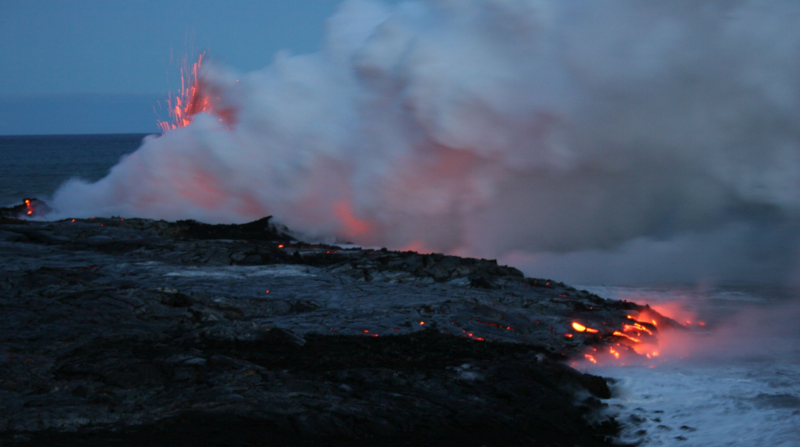 And Hawaii Jeep Tours has just added The Lava Experience to its list of available tours. On the tour, your guide will take you to the closest vantage point available at the time, so you can view the lava up-close and safely. Pros: For those prone to motion sickness, this tour is ideal. No worrying about whether you’ll feel sick during your tour, and that’s a big plus for many folks. Also, price! You won’t find a less expensive alternative than hiking on your own. Active lava flow from east rift zone of Kīlauea by the Puʻu ʻŌʻō cone on Hawaiʻi. Cons: If the lava flow is far from any hiking path, you won’t have the opportunity to see the lava up close. However, recently, this hasn’t been a problem, as the lava has been visible from a walkable distance. But, safety is another concern. You MUST remain in the safe area for lava viewing, as the shelf can be unstable and cause injury. Seeing Big Island lava is one of the most memorable experiences you’ll ever have, and you don’t want to miss the opportunity to see the lava up close. So, weigh your options, and carefully decide which choice is right for you!